We have a lot to be thankful for. We are both healthy, we have been relatively successful in our careers, and we have good families who are also healthy. 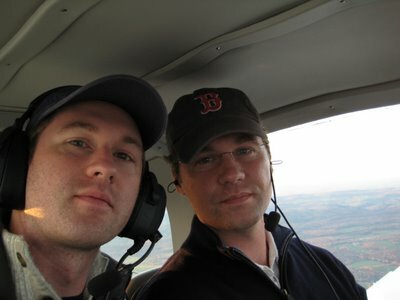 We also happen to have an airplane and the license to use it to visit family on holidays, which is what we wanted to do this Thanksgiving. Our tentative plan was to fly to Knoxville on Tuesday to be with Jodie's family and attend a fundraiser gala for the local children's hospital. The weather was horrible on Tuesday, though, so we postponed our trip to Wednesday and enjoyed Tuesday evening to ourselves. The weather on Wednesday was better. There was a strong wind from the southwest that was blowing the bad weather away to the northeast. The first 150 miles, however, had pretty low clouds. We launched around 1 p.m., under overcast skies and headed west. Crossing the first mountain range, we headed south down the Shenandoah Valley. The clouds were sitting atop the mountain ridges on either side of our route, so we stayed in the valley, just a couple thousand feet off the farm fields below. 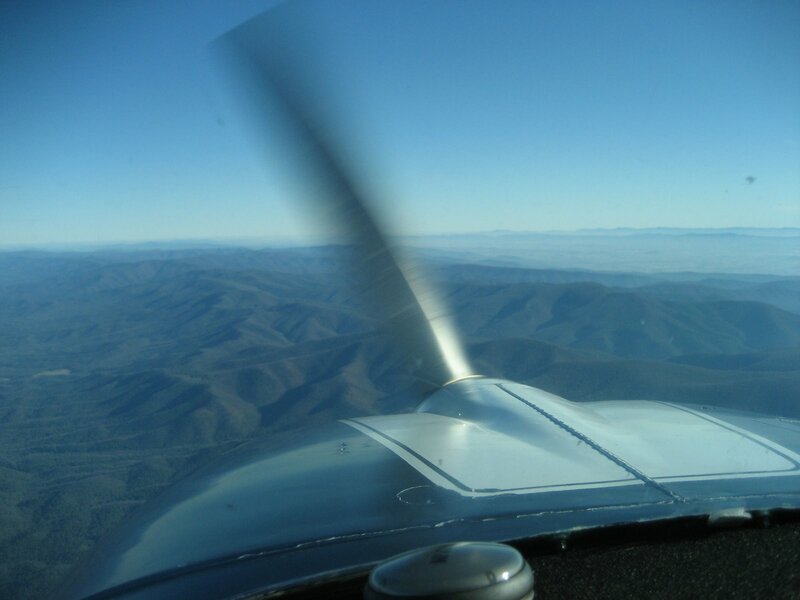 There was an occasional bump of light turbulence, so we cinched our seatbelts tight and I kept our airspeed a bit slower than I normally would have. Then, southwest of Charlottesville, breaks in the clouds began to appear. It was really beautiful. 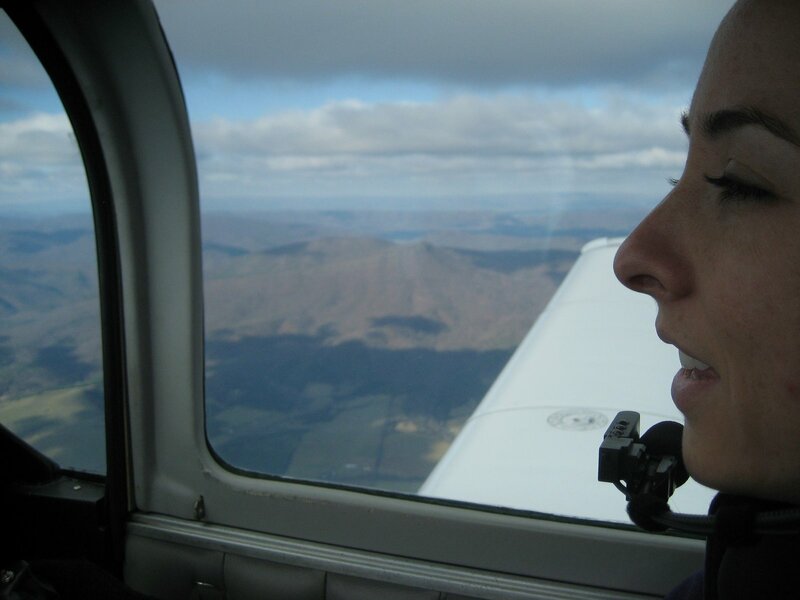 Jodie flew the plane for a while as the overcast layer split into patches of clouds and we climbed above the higher mountain ridges of southwestern Virginia. 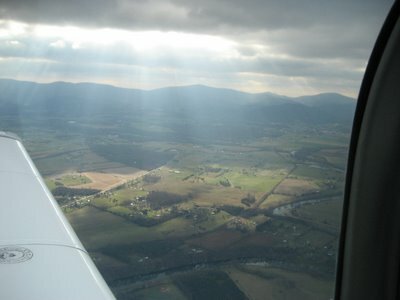 As we passed southwest of Fredericksburg, Virginia, the clouds dissolved completely and we began climbing to 8,500 feet. There was an AIRMET for turbulence below 7,000 feet, and the winds aloft were forecast to be as strong as 50 knots. Wind that strong can create strong turbulence and, in some circumstances, mountain waves, so I wanted to be as high as possible above the higher mountain ridges that were ahead. As most of them did not exceed 4,500 feet, I judged that 8, 500 feet would be sufficient. 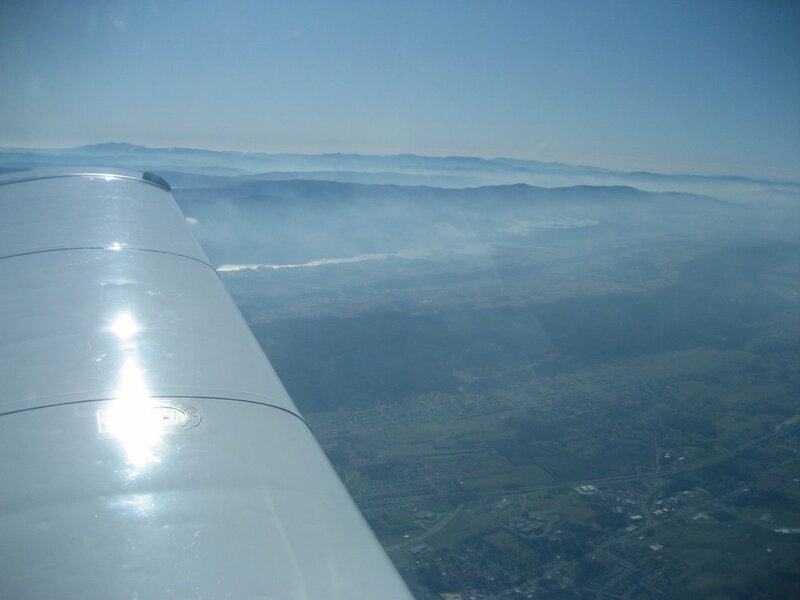 Although the headwind was slowing us by 20-30 knots, the air seemed to smooth out as we climbed through 4,500 feet. We began relaxing and enjoying the view as we cruise-climbed toward 8,500 feet. 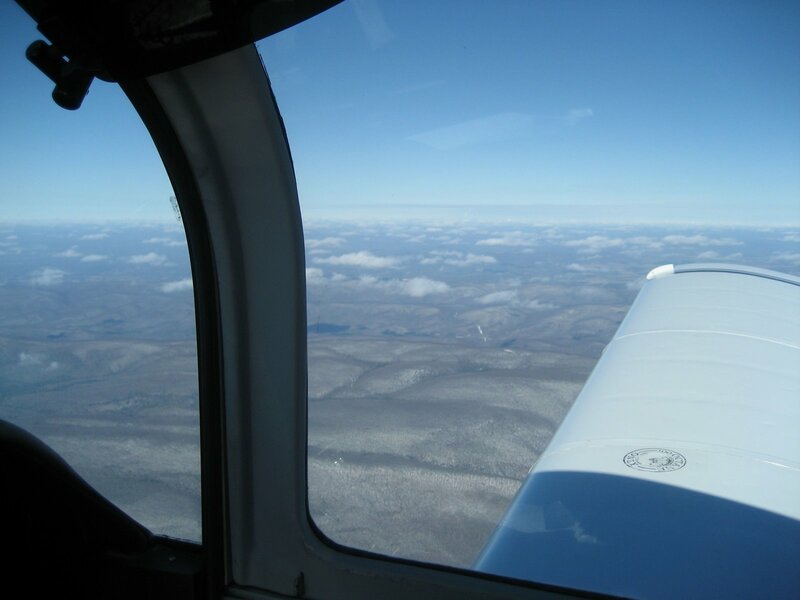 Then, without warning, as we passed through 7,000 feet, it felt like a huge hand came down on the plane. Apologies to Richard Bach: the image of the hand hitting the airplane is borrowed from his description of flying a biplane through turbulence in the Sierra Nevada Mountains in his book, Biplane. It is perfectly appropriate, though, and immediately came to mind when this happened. I hit my head on the ceiling despite my tight seatbelt, the stall warning horn wailed, the nose dropped, and the plane tipped onto its left wing. 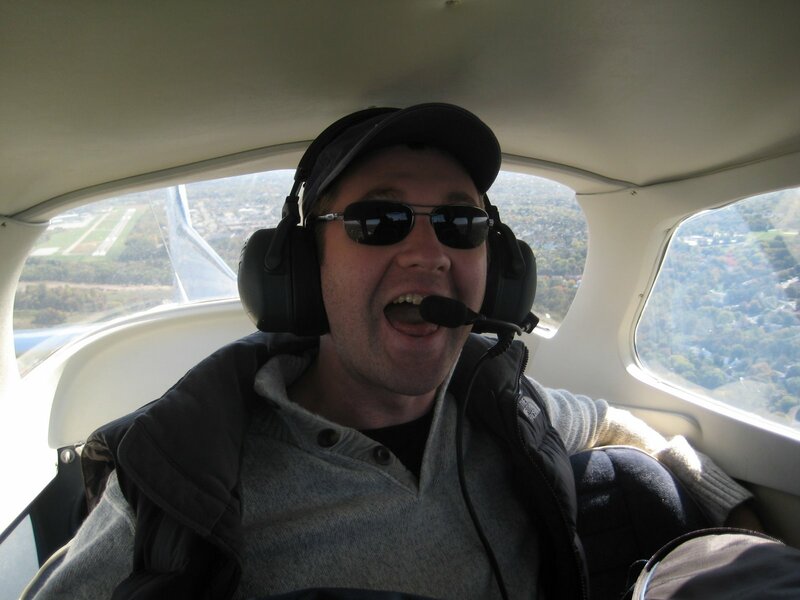 Kudos to my flight instructors -- my reactions were instant and instinctual, and the plane was level and flying again within a second. From there on out, the ride was silky smooth. And Jodie barely blinked an eye. 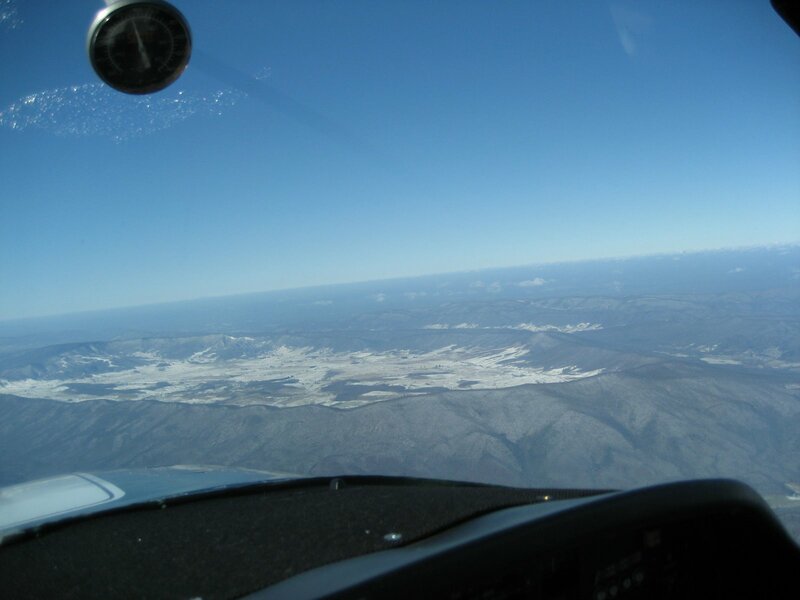 Jodie fell asleep as we passed over the snow-covered higher elevations of southwest Virginia. 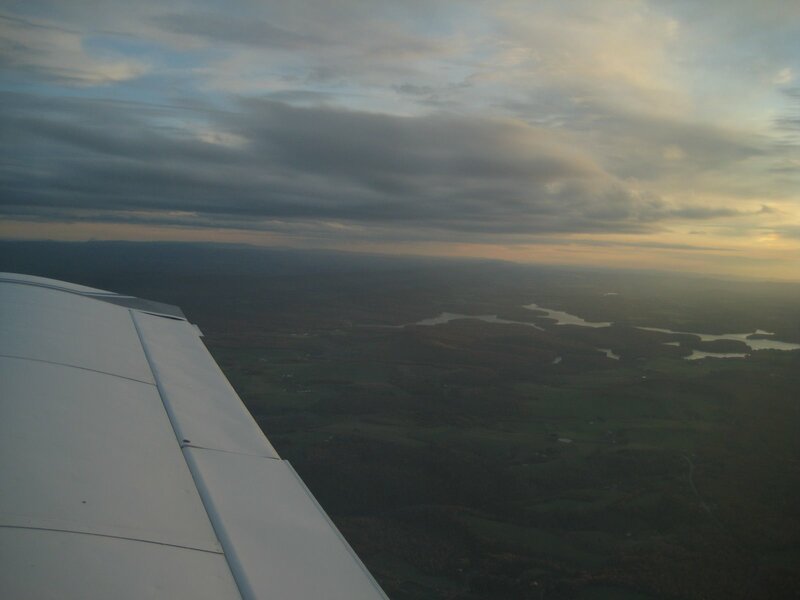 Our true airspeed was about 135 knots, but our groundspeed varied between 95 and 115 knots because of the headwind. Then we began losing altitude. Although nothing had changed in the airplane's configuration, the plane began a descent of 500 to 1,000 feet per minute. I raised the nose, but we continued down. 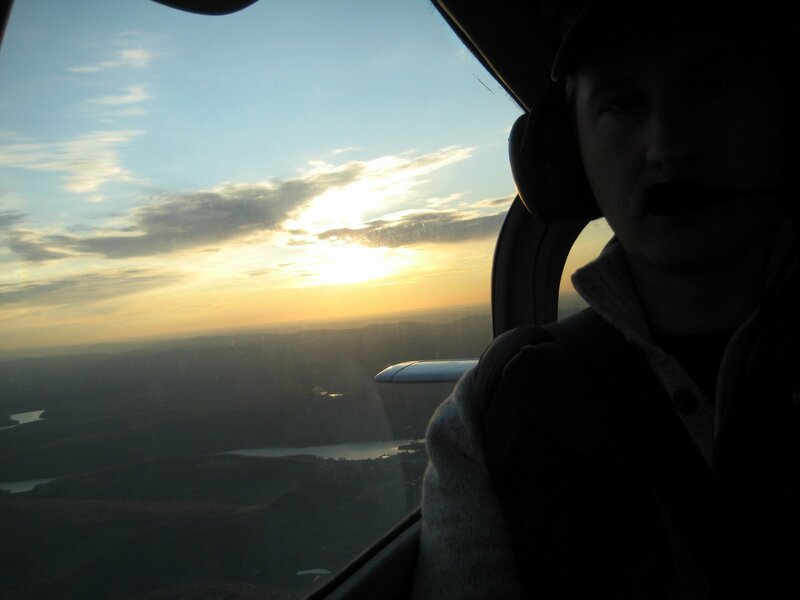 I put in full power and raised the nose some more, slowing the plane to "Vy," its best rate of climb airspeed. The rate of descent slowed to about 100 feet per minute, but that was the best it would do. I suspected a mountain wave, but I wasn't sure. The engine was showing 2,400 rpm. Was that normal? It seemed low for that altitude, but I had never paid close attention to the rpm during a climb. And we were high, so the engine could not make full power.... I didn't think it was unusually low, and all other gauges were normal. I still suspected a mountain wave, but I was not certain. I enrichened the air/fuel mixture: no change, and we continued down. I leaned the mixture: no change, and down we went. Pulaski airport was about 22 miles away, and I adjusted our course toward the airport, debating with myself whether I should turn further east toward Roanoke. Roanoke was closer, only 15 miles, but there were mountain ridges to cross, whereas there was only valley between me and Pulaski. I was confident I could make it to Pulaski if we continued descending, but wasn't certain we could clear the ridges on the way to Roanoke. With the nose raised, trying to climb, our groundspeed was about 65 knots (75 mph), agonizingly slow. We were now down to 7,000 feet. I still suspected a mountain wave. All indications were that the engine was fine. There was no ice, nothing that would provide a mechanical explanation for the airplane being unable to hold its altitude. The altitude held at 7,000 for a bit, then fell to 6,800 as we struggled toward Pulaski. Then, just as suddenly as it had begun descending, the Tiger started climbing, slowly at first, then at 1,000 feet per minute, its normal Vy climb rate. A couple minutes later, we were again level at 8,500 feet and back to our usual speed. Mountain wave? I wondered. Then I heard a jet pilot talking to air traffic control. "I just went through a heck of a downdraft," he said with a southern drawl. I nodded knowingly. I waited to see if the mountain wave would repeat itself, but we never again had trouble maintaining our altitude. Jodie woke up as we crossed into Tennessee and began picking out geographical features -- rivers, the Clinch Mountains. 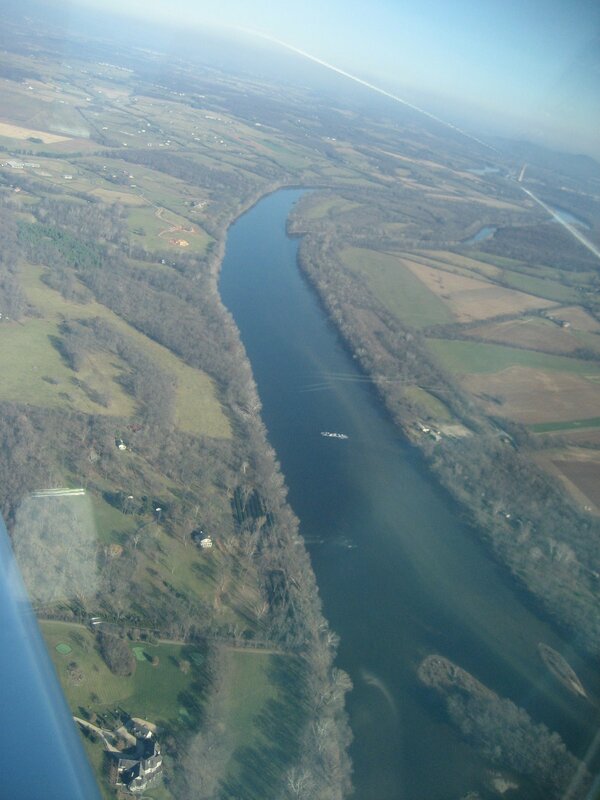 Then Cherokee Lake came into view and we followed the Holston River to the airport, with the Great Smoky Mountains off our left wing. 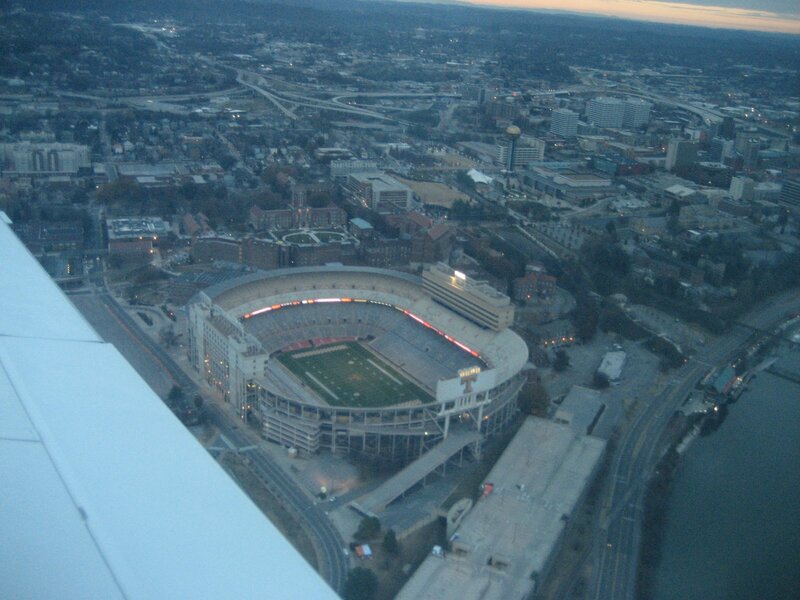 Overall, the plane worked out great for the trip to Knoxville. Other than our experience with the Giant Hand, the ride had been comfortable. Although our 10 minute ride on the mountain wave had got my attention, it had been smooth and both Jodie and Millie slept through it. And even with the strong headwind, the trip took only 3 hours, 35 minutes, far less than the 8-9 hours it takes to drive. We had a wonderful holiday with family and friends. Instead of shopping on Black Friday, Jodie and I spent the afternoon at the Downtown Island airport in Knoxville. I met someone who also owns a Tiger and who had, until now, been just a name on an email. As we talked, Jodie's cousin arrived with his wife and airplane-crazy boy, Nicholas. Before the day had ended, all three had been for a flight around Knoxville in the Tiger, but I'll write a bit about that separately. As Friday drew to a close, it was time to plan our return. Saturday looked to be okay in the early morning, but heavy rains and wind were forecast to arrive from the south sometime before noon. Jodie and I decided to pack the plane and shoot for a 7 a.m. departure. 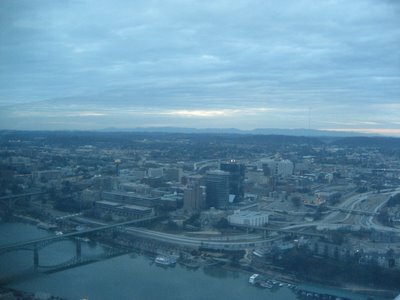 We lifted off minutes after sunrise, at 7:38, into overcast skies and circled west over downtown Knoxville before turning northeast for home. As we headed north, the cloud cover began breaking up. It was another beautiful flight. I had been hoping for a tailwind to at least equal the headwind we had had on the way south, but the wind only gave us a 5- to 10-knot push. 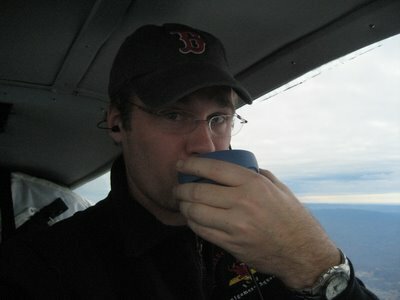 Jodie flew while I enjoyed the thermos of coffee that her father had prepared for us, then she leaned over and napped while I flew on through smooth and clearing skies. By the time we crossed the relatively barren and isolated mountains of the Ramseys Draft Wilderness, there was not a cloud anywhere to be seen and the visibility was at least 50 miles. There was neither turbulence nor mountain wave activity, and it was a treat to look down on the folds of the mountains below. It wasn't long before we were passing White's Ferry over the Potomac River and approaching the airport at Gaithersburg. Just under three hours after liftoff, our tires chirped as they contacted the runway. I got almost no work done on Wednesday. In fact, I didn't even make it to the office. I intended to, but I had something to do. After several days of low clouds and rain, the weather on Wednesday was decent for flying, so I went to pick up the Tiger from its annual inspection. It was a long process. 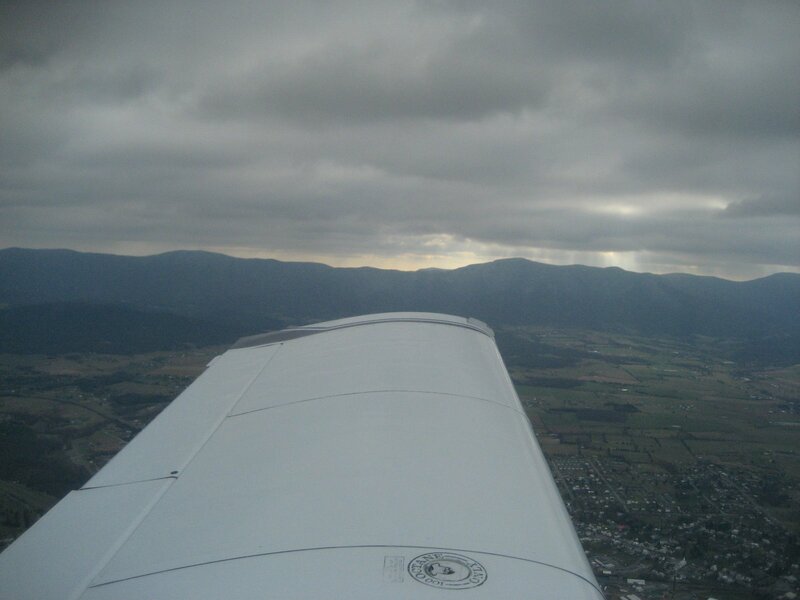 The flight up in a Cessna took an hour and a half due to a stiff headwind. Complied with Airworthiness Directive ("AD") 79-22-04 regarding aileron system. Complied with AD 99-24-10 regarding the standby vacuum system. Complied with AD 81-24-03 regarding engine power loss prevention. Inspected the Emergency Locator Transmitter ("ELT"). Inspected for conformity the installation of the JPI EDM-800 Engine Monitoring System I had installed after Oshkosh. Checked engine compression: 74/80, 72/80, 74/80, 72/80. Removed and replaced all engine related fluid bearing hoses (fuel and oil). Installed Nosewheel Landing Gear Fairing. Removed and replaced rudder springs. Removed and replaced all rocker box cover gaskets. Removed and replaced the windscreen and canopy seals. Repaired co-pilots seat track as required. Installed lower cowl air deflectors to improve engine cooling. Serviced all wheel bearings as required. Lubed all required airframe and engine points as required. Removed and replaced vacuum regulator filter. Serviced and charged battery as required. Checked all interior and exterior lights. Removed and replaced induction air filter. Washed the engine as required. Cleaned and vacuumed the cabin interior. Washed and waxed exterior of aircraft. Cleaned windscreen and all cabin windows. Replaced brake rotors and pads. The plane looked great. I looked carefully at the items Hortman had repaired, changed or installed, and their work looked great. I did a careful runup, called the tower, and took off into a wind that was 10 knots gusting to 20 knots, right down the runway. The Tiger climbed at 1,500 feet per minute for a bit, then settled into a 1,000 foot per minute rate as I headed west. I climbed to 4,500 feet as I came out from under the Philadelphia Class B airspace, and the air smoothed out a little. It was still bumpy, and I hit my head a few times in the turbulence, but the Tiger handles bumpy air better than any other plane I've flown. I pulled the throttle out and adjusted the mixture with the new vernier mixture control that had been installed. Just over an hour later, we touched down smoothly at Gaithersburg. A few friends met me as I took my time putting the plane away until the next flight. As I walked to the car, I looked back and smiled. It's good to have the Tiger back where he belongs. My brother came to visit a few weeks ago. My work schedule and his new baby have made visits all too rare, and time together has become one of the most valuable commodities in life. He's three years younger, but we went to the same schools and overlapped a year or two in college. It seems we had unlimited time to hang out. I think back wistfully on the nights we'd take my pickup to a nearby lake and back it down the ramp into the water, then climb in back and hang out on the tailgate, skipping bottlecaps on the black water and talking. Time was abundant. But no longer. So it was a treat for him to come visit for a weekend. Jodie had to work one of the days he was here, and David had never seen our Tiger, so we decided to go flying. But the Tiger was at an airport in Hagerstown, Maryland, having some work done on the avionics. 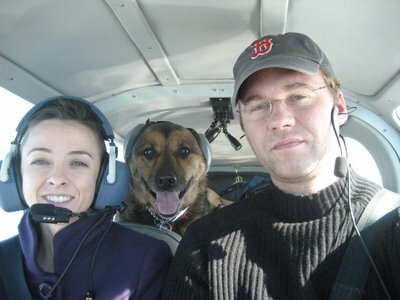 Amy, a friend and fellow pilot, volunteered to go with us to Hagerstown so we could get the Tiger. I flew up in good old Three Five Romeo, with David in the back seat. 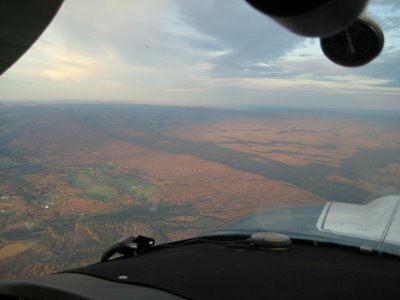 It was a beautiful day, but windy and gusty, and the fully-loaded Cessna made for interesting flying during the final approach into Hagerstown. 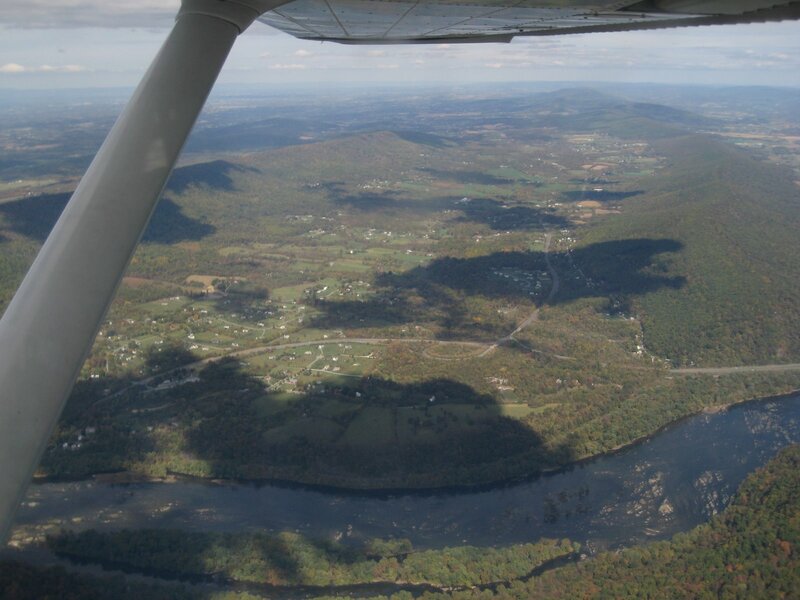 To further complicate things, President Bush was at Camp David, so that protected airspace extended to within a mile or two of the Hagerstown airport. We landed and taxied to where the Tiger was parked, then Amy took off for home in the Cessna while I showed David around the Tiger. We had no plans, so the next question was, "Where do you want to go?" David is applying for residency programs, and mentioned that he was considering a program in Morgantown, West Virginia, about 100 nautical miles west of Hagerstown. Eager to show him the versatility of general aviation, I said, "Let's go," and started programming the GPS. 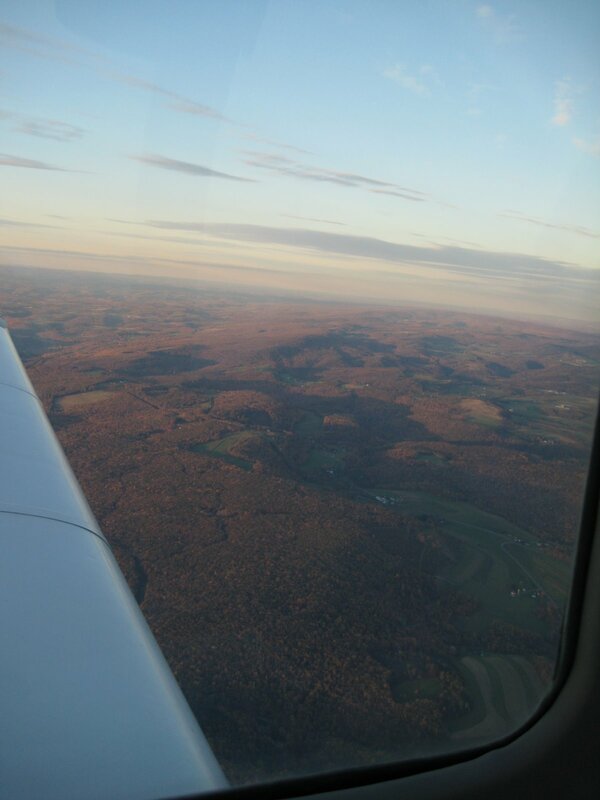 It was a beautiful flight to Morgantown. We landed, then asked about a crew car or other means of transportation so we could see the "downtown." There was no transportation available at the airport, but we could call a taxi. After a 30 minute wait, a smelly cab arrived to drive us downtown. We walked around, got an ice cream, then took the PRT, Personal Rapid Transportation, Morgantown's pride and joy, up to the hospital. We called for a cab again, waited another 30 minutes, then headed back to the airport with the taste of coal dust on our tongues. The flight home was the best part. The air was smooth, and the setting sun made for beautiful views. The foliage was red and orange in the mountains (though still green back in the Washington area), and we raced the sunset to Gaithersburg. 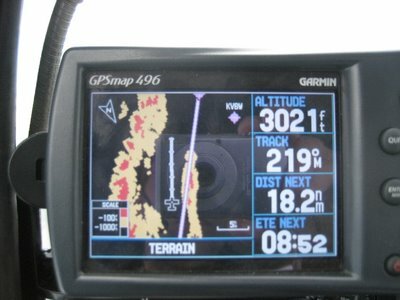 It was 130 nautical miles from Morgantown to Gaithersburg, but we had a tailwind and saw speeds up to 166 knots across the ground. The sun set as we descended over Martinsburg, West Virginia, and ducked under the Class B airspace around Dulles International Airport. 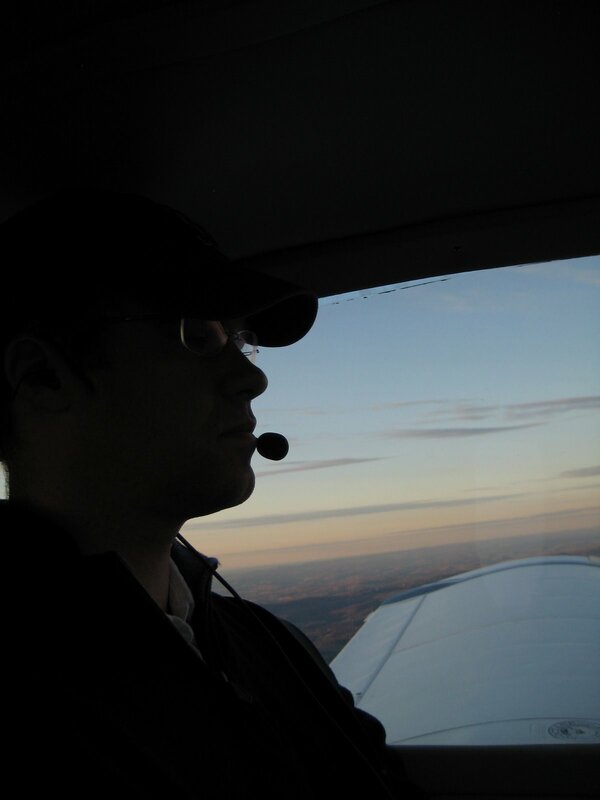 I clicked on the runway lights at Gaithersburg. With calm winds and no airplanes in the traffic pattern, we did a long, straight-in approach to Runway 14 and touched down smoothly. It was a great day of flying and, although Morgantown may no longer be on David's list of possible places to go for residency, I'll have fond memories of that trip for a long time. Once a year, airplanes like the Tiger need to undergo a full inspection, an "annual," to confirm that they are airworthy and have no conditions that affect its safety. While the plane is "in for annual," many owners take advantage of the close inspection to have mechanics replace parts that are worn or old. The result is that many airplanes are virtually "renewed" once a year, and hence last many years beyond the useful life of cars or trucks. The Tiger's last annual expired on October 31st, so I arranged with Hortman Aviation to have them conduct the annual inspection on the Tiger. When I was shopping for an airplane, I hired Hortman to inspect a potential purchase. Hortman found, among other problems, a small crack in the engine mount. To me, that was evidence that Hortman paid exceptionally close attention and knew these planes well. And they should -- Hortman was a major Tiger dealer when the airplanes were being manufactured, and still has several available for rent. Hortman is located at the Northeast Philadelphia airport, which is - you guessed it - northeast of Philadelphia. 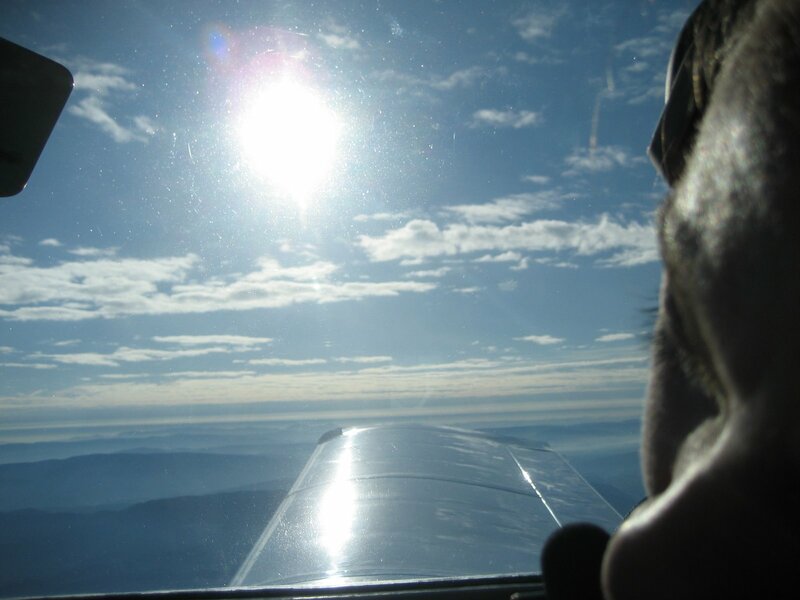 A friend, Gashaw, volunteered to fly another plane up to bring me back, so we set off on the afternoon of October 31st to deliver the Tiger for its annual. I have been billing in excess of 200 hours per month the last few months, and hadn't flown in a while. The flight of an hour and fifteen minutes was beautiful and just what I needed to decompress a little. 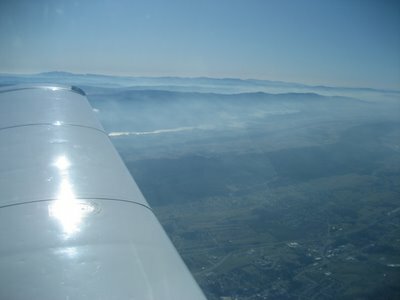 It was a gorgeous day, with clear skies, only the lightest haze, and moderate winds. I chose to go east, through the corridor of airspace between Baltimore and Washington, northeast across the Chesapeake Bay and Delaware, and up the east side of Philadelphia. I left the keys to the Tiger with the boy at the Hortman desk, and we took off into the darkening sky in the Skyhawk Gashaw had flown up in. It felt odd to leave the Tiger there, but that feeling was quickly overshadowed by the enjoyment of the night flight with Gashaw. It was crystal clear, and I looked down on the goings-on with interest. 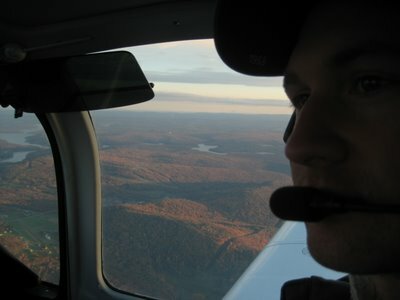 Gashaw had offered to let me fly the Cessna home, but I wanted to be a passenger. I watched house lights come on, and observed a play or two of a football game. The players were clearly visible in their stark white uniforms, the green field lit by floodlights. As we climbed to out initial altitude of 3,000 feet, the city of Philadelphia was just off our left wing, and a rising crescent moon was directly off our nose. 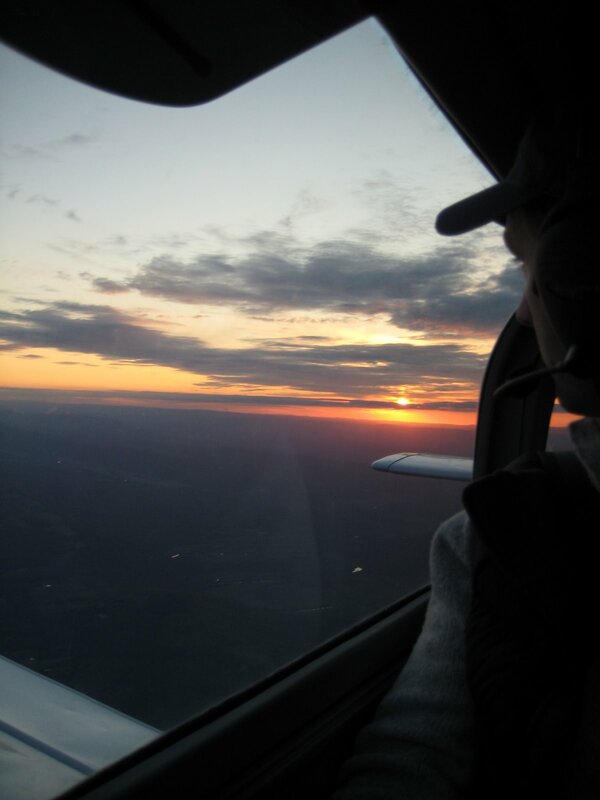 It was beautiful and serene, and reminded me how much I enjoy flying at night. We landed around 8pm and I drove home. 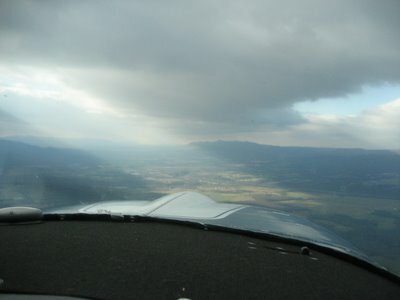 A lot of stress had bled off while flying, and I was happy and relaxed. 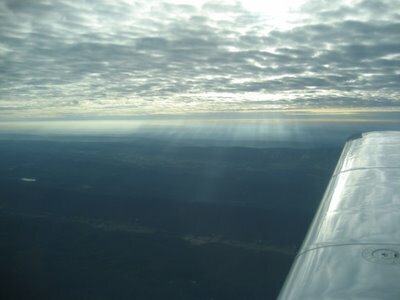 The flying truly had, as St. Exupery wrote, freed my mind from the "tyranny of petty things." Epilogue: A week later, the Tiger is still at Hortman. I decided early on that I would use the annual inspection as a time to replace anything that was nearing the end of its life. "No deferred maintenance for my plane," I said. So, the mechanics at Hortman are hard at work performing several tasks -- new brake pads and rotors, some gaskets, new fuel and oil hoses, rudder springs, and so on. It will likely be ready for pickup on Monday or Tuesday, and I'm hoping to retrieve it before leaving for another business trip to Michigan on Tuesday or Wednesday.